Beautiful views with this waterfront Florida Keys vacation rental, dockage, one bedroom duplex house. Comfortable Florida Keys accommodations directly on the water in an original Keys fishing village. Three different rentals at this FL Keys vacation rental - 2 one bedroom units and 1 two bedroom unit. Conch Key Landing has an upstairs and a downstairs apartment, each with an open view of Florida Bay and memorable sunsets. Egrets, herons, and pelicans are daily visitors. 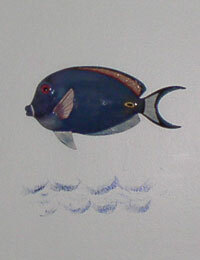 Tropical fish can be seen around the docks. There is very protected dockage for boats up to 26 feet. (Children must be supervised near the water.) There is immediate access to fishing on the Bay and less than half a mile to the open ocean. There is free parking on site for your vehicle and boat trailer. There is a boat ramp at the convenience store on the island. Each one bedroom apartment has a king-sized bed and a queen-sized pull out sofa bed. The kitchens have ample counter space and are fully equipped. Each has a large porch area with picnic table and propane BBQ. All utensils and bed and bath linens are supplied. There's cable TV and a washer and dryer. Also adding to our vacation rental property a brand new, 2010, vacation rental two bedroom 2nd story home which will accommodate up to 6 people. Boat dockage is also available with this comfortable and clean accommodation in the Fl. Keys. This new rental has a gated balcony, parking for one vehicle/one boat trailer. Yes, we do allow a well-behaved dog. Our little island in the Middle Florida Keys is a lobster fishing village. You can walk down to where the fishermen bring in their catch of the day and purchase - fresh off the boat - your evening meal of stone crabs, Florida lobster, or our local fish (when in season). We also have a licensed charter boat guide who lives on Conch Key and he'll be glad to take you fishing, bird watching, or snorkeling. OR! Do all three and pack a lunch. Contact Capt. Dan for this charter boat excursion. Don't forget to go scuba diving or snorkeling with the best dive shop in the Florida Keys, Tilden's Scuba Dive Center. Conch Key is located on the Bay side of US 1, at mile marker 63, 15 minutes from Marathon, Florida. You'll find the residents friendly and helpful. They have lots of fish stories and can tell you where to catch the big ones. Come visit with us for your Florida Keys vacation. The relaxed and easy going atmosphere and comfortable accommodations at Conch Key Landing will keep you coming back, again and again. Conch Key has a convenience store with supplies for fishing, groceries, fuel, and ice. Marathon, Fl. is 15 minutes to the south of Conch Key. Key West is one hour from Conch Key. Long Key State Park is a close- by attraction for kayaking and walking nature trails. Long Key Bridge is 2.8 miles and is within walking distance of Conch Key. Walking, biking, fishing are fun from this bridge.